Something worth to see around this area is the waterfall Three Mills, because of its uniqueness - it is the northernmost Kalksintervorkommen in Europe - declared a natural monument. Since the last ice age about 10,000 years ago, commuted three emerging caves spring water back and forth and have had formed a 300 m long and 100 m wide limestone Bank . 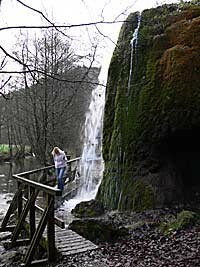 During the construction of the railway line to Jünkerath , which opened in 1912 , the source streams are merged, whereby the " growing " waterfall Dreimühlen originated and moss beds formed by depositing travertine. Through this constant process, Waterfall is growing 8-10 cm every year into the valley.